It’s a funny one for me because I’ve caught many fish that have given me some great and very fond memory’s. 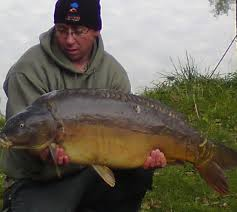 If I had to pick one I guess it would be a recent capture of a fish that I’d seen for years in a park lake. I used to pass the lake whilst out working and frequently stopped to watch a few of these big fish feed in the margins. 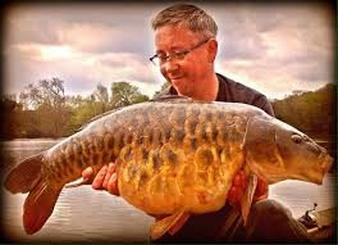 I always carry some bait in the van and had my rods set up from a session the night before. So I grabbed a handful of bait and proceeded to trickle a bit in when I noticed the carp getting straight on it, almost taking it on the drop. There were four fish all in the vicinity that were picking off baits but one in particular was a fully scaled beauty that I could clearly see as the water was like glass. I’d seen this fish as part of a small group for years but had never stopped to fish for it. Returning from the van with my rod, I lowered the rig in front of it and a small common of about 12lb went to take the bait but then the fully scaled literally barged the common out of the way and sucked in the rig. I didn’t even need to strike as I could see the fish trying to deal with the rig but not able to eject it. It always amazes me how long it feels like you’re in battle with a carp as it generally feels like an eternity but after a few minutes I watched as it came gliding over the front of my net. I wasn’t quite ready for what I uncovered as it was the most amazing looking fish. It was over 30lb but size really was irrelevant with such a creature. If you could only fish one lake for the rest of your time where would it be and why? That’s a tough one! I think it would definitely have to be an English venue to be honest. I guess it would probably have to be somewhere big and windswept like Wraysbury one. Not only has it been fished by so many great thinking anglers but it’s massive. 160 something acres and it’s as clear as glass which is something that appeals to me. The thing with these places is that you never know what might be lurking beneath the surface. As we know carp can be creatures of solitary as well as mingling along with others but sometimes simply don’t get caught. You’d never know what it might throw up and every take would probably have you trembling in your boots and I love the unknown. Biggest edge when tackling a new water? With spring around the corner what’s your plans ? I’m really looking forward to spring this year as we’ve had so much rain it’s been both terrible and monotonous. We haven’t really had a winter which has been slightly odd but I’m really looking forward to the warmer weather. I’m not one for boiling hot sun but love it when you can sit around on the bank in shorts! I’m planning to do a bit more on a special water that I joined last year but will try to choose my days carefully as I’m not one for angling around loads of other anglers. That’s not to mean I’m unsociable as I’m the complete opposite and will speak to anyone but when venues are rammed with lines I just think it spoils the whole feeling of what carp angling is all about. I know its something we all have to put up with from time to time but if you don’t like it you don’t have to do it, simple. However I’m planning to get plenty of visits in without actually fishing because as I mentioned earlier it’s one of the best tactics to employ. I’ll also trickle a bit of bait in here and there and when I say a bit, I mean around 30 boilies over the whole lake. One thing to remember is that after the carp ‘hopefully’ eat the bait that I’ve introduced they will then pass that through thus spreading my bait even further. Although it won’t be quite the same as it was when it first went in the water, the smell and flavours will still be spread around a wider area than the small spot it first landed on and once again they will encounter that and eat it again. Roll on spring! If you could get rid of one thing from the fishing industry what would it be? I’m quite fortunate that I don’t let anything really get to me regarding the angling trade as such as I’m generally too busy so I concentrate soley on what I’m doing with both work and angling. My angling is a personal thing and no matter what anyone thinks it’s mine and I can say it’s mine if that makes sense. Saying that if I had to take one thing away it would probably be the petty bickering that can arise from time to time. Lots of people seem to have lots of views and opinions and because of our popular social media we can all have our say. However opinions and voicing them usually gets you nowhere especially if it’s something you might be thinking of that you don’t agree with, as generally you’re usually on your own or it’s a small group of people that aren’t going to make any difference. If you can’t say something nice or decent I personally don’t want to hear it although I’m always up for constructive criticism. Whats your views on the otter issue? I’m probably as guilty as the next guy that hasn’t been doing enough to spread the word regarding these furry critters. I’m all for nature and keeping what’s around us for a long as possible. I’m always picking up line that’s been left by bad anglers as well as rubbish. Nature is just one tiny part of the magic that our angling revolves around and we should all do our part to ensure we don’t give ourselves a bad name as well as keeping what should be here, here. It’s bad enough getting bad press from anti angling campaigners let alone getting it in the ear from our own fellow anglers. As far as I see it we must spread the word but not just because we want to be heard but mainly because any serious campaigning needs funding. The petitions that were flying about over Facebook and Twitter really need to be signed as the government won’t even consider listening to us until we have over a certain number of people’s signatures. It’s all too easy for us not to worry about it when the problem isn’t on our own door step but the day that it comes to your lake you’ll be livid. When the cormorants started to become a problem it was thought that it would be fine, the circle of life will evolve and once they’d eaten the small fish it would leave the carp to simply get bigger. Well in some cases it has but I’m many you couldn’t buy a bite from a roach from many stretches of river and lake. The situation has improved slightly but only due to legal control to keep numbers down. More can be found out about this major problem via www.thepredationactiongroup.co.uk If there’s one thing like I’d to end on is that we ALL need to stick together and that means, match men, pleasure anglers, koi rearers, in fact anyone that’s involved with fish not just anglers! That’s interesting, as of late, I’ve noticed a small trend emerging with some returning back to tight lines. For me though I’ve come to a conclusion that so long as the last few meters of your line is as close to the bottom as possible then that’ll do me. I used to be a massive back lead fan and would use one when ever I could, even a drop off type in weed but the last few seasons have seen me change that thought process completely. I’ve been fishing with tiny pieces of putty spaced out up my line for a good few years now but have put them much further back now than you might imagine. I usually have the last one so that it just misses the tip ring then around five bits spaced out down the main line toward the lead. I never use leaders (except when casting extreme range) or lead core either I just think that a big thick length of line toward the end of my terminal set up could be spoiling the presentation. Especially as many lead core and leader materials are not quite as supple as you might think. Some of the leadless ones are quite good but then I’m not keen on the diameter. All in all, so long as I can get as much of my main line out the way of where the fish might be feeding then that’s perfect. The other side of it is that I feel that indication really becomes a problem when your line is so slack especially in large open waters. For me an ultra effective rig certainly comes into play when you have such worries concerning slack lines and indication. What has been your greatest angling achievement? I think my greatest angling achievement would have to be, becoming fortunate enough to now write for CarpWorld and Crafty Carper. I’ve always read magazines over the years and certain books. In fact anything that I could gain knowledge from but especially by those anglers that were at it full time or those that worked but were obviously hooked to angling enough to write literature on the subject. My belief is that you cannot learn to angle from a book but you CAN read about others experiences in order for you to try it differently. I always used to love to read the Anglers mail as it had lots of great information about shotting patterns, what float to use for what situation, how flow works on rivers etc etc. usually stuff that was interesting and unusual. 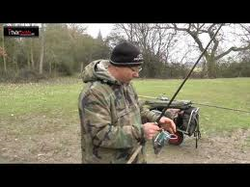 Bait always fascinated me and from the beginning of my angling hobby I would always frequent the local tackle shop on a Friday to spend some of my hard earned wage on the latest liquid or new groundbait inclusion. From there it spiralled and my passion for that subject became stronger and stronger I wanted to know exactly why things work and how to get the best from them. Some years back whilst reading Tim Paisleys foreword at the begging of Carpworld he went on to mention that he would really like to have an unbiased writer that wasn’t sponsored, that was a general angler with experience to write a bait section. They’d had a Rig World section with the same idea and it was and still is very popular because it’s written by Mike Kavanagh who isn’t sponsored and so writes his truthful opinion on what he finds. The words (any offers) was written and so I wasted know time in emailing Tim and asking him what he’d require to get this thing off the ground. After a reply from the man himself he asked for the material and with a week gone by I opened my email to find a reply from Tim that explained that what I’d sent was perfect and exactly what they’d been looking for! I was ecstatic to think that I can finally write about what I’ve found over the course of angling career some 25 odd years. At last I had an outlet to show fellow anglers the best ingredients and latest baits to be released. It’s a great outlet and I love doing it with a passion! To most, they’re angling achievement would be a capture or captures maybe but to me it’s just that.